This is one of the reasons I love the Internet. Before it existed we were stuck with expensive telephone bills as we attempted to track down and interview witnesses in UFO cases. When we could afford to do so we might travel long distances to interview a witness in person. Today cell phones have eliminated the telephone charges and allow us to find witnesses much more cheaply and easily. We are able to confirm information that has been published by others and get to the bottom of some of those UFO reports. Illustration of the UFO encounter. On May 13, 1978, I Kerman Senior Police Officer, Manuel J. Amparano, had a ride along police chaplain trainee Pastor Tom Johnson, who rode with myself until 02:30 A.M., Kerman Police Officers, Arvin J. Byington and Robert Mueller, were with me until 03:20 A.M., After the sighting, I drove to the Savemart store parking lot on Whitesbridge and Madera Avenues, to make sense of what I had just witnessed. I was shortly met by Phil Maher a retired Special Deputy US Marshal, who reported observing a bright reddish orb flying east parallel to his location at Whitesbridge and Grantland Avenues, where he had stopped his vehicle. I wonder, where did I have time to use a sunlamp. After speaking with Phil, I went to the police station and began to call the Fresno Airport Control Tower, Air National Guard and Fresno Meteorologist Station, located at the airport at the time. It was during this time, when Officers Byington and Mueller came back to the station, to check the work schedule, when they witnessed I was sunburned. They asked me what the hell happened to you while we were gone. It was Officers Byington and Mueller, who said that years later there was an area in the field where the UFO had hovered, where nothing would grow, it was just a circular round spot in the field. I learned about this event years later as I had left Kerman for a position with the Fresno County Sheriff's department. I was also told by Deputy Paul Baker, that a deputy working out of the Town of San Juaquin southwest of Kerman had also viewed the UFO and wrote a report. I ask, did anybody bother to interview these witnesses, before debunking without having the facts. Chief Van Cleaf filled out the workman comp request form from information obtained from Officers Byington and Mueller. Chief Van Cleaf was not the type of police officer, who would fake a report, far from it. It was also reported in the Fresno Bee, that Chief Van Cleaf, reported that he was in contact with an Air force Major, working out of the office of the secretary of the air force at the pentagon. If you travel to the place of occurrence, and view the terrain, interview witnesses as to their location during the sighting and what they observed first hand, then you can give your opinion by obtaining evidence first hand. I did not report to the hospital until fifteen and ahalf hours after the sighting. Officers Byington, Mueller and officer Ed Singh, who relived me and witnessed my burnt condition, pleaded with me to go to the hospital for medical treatment. I delayed as long as I could stand the pain, as I did not want what happened to me to get out to the public. Officer Byington, had called my wife to check on my condition, as he told her while in the station, he and Mueller observed my body twitching. My wife Barbara told Byington , that she had observed the same thing while checking in on me while I was a sleep. Officer Byington told her get him to the hospital. It was my wife who first observed blisters on my ears, and this was reported to the doctors at community hospital. I was told by the doctors that this was new to them and they did not know how to treat my condition. I was given codine pills to help with the pain that they observed, I was experiencing while in the examination room. I was under doctors care for about a month after the sighting. I retired officer Manuel Amparano never reported or said, any of the comments that I have read on this blog. I never did report a silver object, I reported an object the color of the setting sun. I also never said, that the object was up in the sky as some of you people are stating. It was reported as below tree top level which made it appear a tree was on fire. There is no known atlas rocket that can hover behind a tree and not make any noise. The report of my encounter mentions that I felt a tingling sensation as I viewed the unknown object. You people got it all wrong read the true reports that were printed by some news media. There is information reported in various sources from 1978 that seem to suggest something else. The altitude of the object is said to have been between 100 and 150 feet in the air, which suggests that it was above the trees. When he saw it from a distance, it probably did look as if it was in the trees, or a tree on fire as he suggested at the time, but when he approached it, a better estimate of the altitude could be made. In other words, and to prevent a discussion on how difficult it is to estimate size and altitude at night of an unknown object, it would have become apparent that the UFO was above the trees when he got closer to it. 1978 Kerman UFO media reports. Phenomena Research, discription of ufo, orange-reddish glow like a fire, May 24, 1978. Kerman news, saw a reddish glow thought it was a tree on fire, May 24, 1978. International UFO Reporter 9/78 vol.3, no 9. saw reddish glow. February 23, 1979, Fresno Bee, saw large fire color of setting sun thought tree was on fire. Yes, this is somewhat confusing. Amparano wrote that the Phenomena Research had mentioned the reddish glow and I don’t know if this was APRO or some other organization. The ARPO Bulletin of August 1978 does include the “silver aluminum, round” craft in quote as if it came from Amparano. According to the Bulletin, APRO Field Investigator Peter Escobedo reported that he had talked to Amparano and it appears that Amparano did give him the description of the silver aluminum craft. According to a reporter for Los Angeles Herald-Examiner, Steve Comus, and based on the descriptions provided at the time, the object was circular and about thirty feet in diameter… The only objection seems to be the comment about it having a silver color. The APRO Bulletin does mention the orange glow. 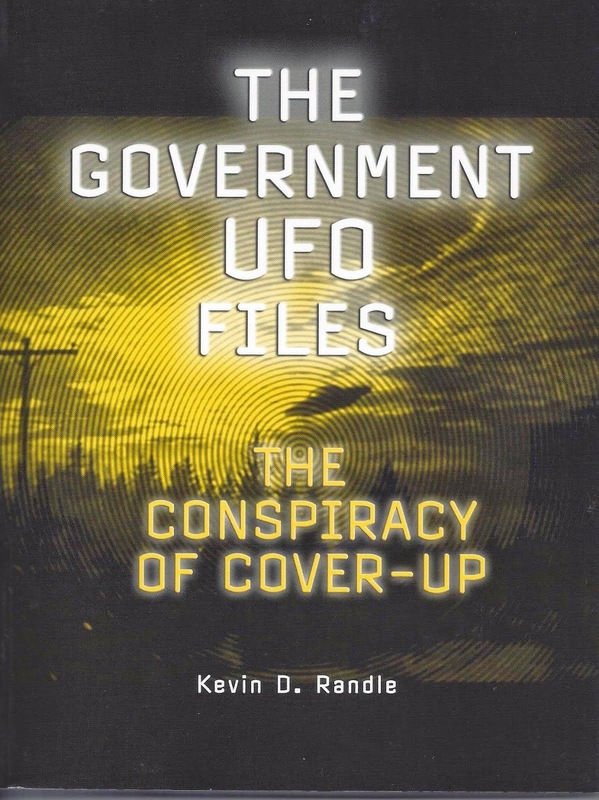 But, it should be noted that the APRO story was put together based on what Escobedo and Comus had discovered during their interviews with Amparano within days of the sighting in 1978. The source of the silver color quote appears to be in an article that Amparano wants us to review. Albert said, I referred to the ufo as the size less than a full moon, bogus information as nothing of the sort was ever reported in the media or police reports. Lance said, sheriff filled out comp report, I was a Kerman police officer not a Fresno County Deputy Sheriff and no sheriff filled out my workmans comp, bogus information again. It appears someone is spreading false information about the kerman ufo. Please obtain the correct information before you make a false comment. I have copies of all the known news reports and nothing compares with what you people are discussing. in 1978 and some of the sources Amparano quoted have been used to gather the information. The NICAP website used the Fresno Bee as one of their sources. The NICAP site said the UFO was smaller than the full moon and that it was oval-shaped. Both the sources from 1978 and those from today seem to confirm what was reported here which was based on the interviews and words of Amparano collected in 1978. Gentlemen, If a medical employee working at Fresno Community Hospital had not leaked out my medical condition or how I received my sunburn condition to the local media, this debate would not be taking place. I did not wish to cause damage to my police career, and I did receive a setback as Kerman Chief Of Police James Van Cleaf prior to leaving for a position with Dixon Police Department passed me up for a sergeant position because of the UFO sighting which leaked out from the hospital. Chief Van Cleaf was not my friend and he did not want a police officer going in front of the media and confirming he observed a UFO while on duty. Officer A.J. Byington a witness was asked by the chief what he had witnessed that night and was not ordered to write a report as were the other officer;s involved with the sighting. The other officers and police chaplain, my ride along that night confirmed my condition when I reported to work, and what occurred during the night shift. Enough said, "gentlemen". What is interesting here is not the information about the compensation claim but the information that the report caused Amparano some personal trouble. As we have seen in other UFO reports, those making them often find that their careers suffer. We have heard of police officers who leave law enforcement, pilots who find themselves “flying” a desk, and military personnel who are persuaded to “modify” their reports. This is just another example of it coming from the man who suffered the consequences. May 13,1978, UFO chronological order of sighting's by witnesses to event, occurring in City of Kerman. First sighting began at 02:30 A.M., Trinity and Shaw Avenues, by a farmer who notified north central fire department Kerman station of a grass fire in a field. A fire truck from Kerman and one from the town of Biola responded to the given location reported. The firemen found no evidence of a fire in the field. About 03:00 A.M. a farmer Thomas Addis observed a glowing red object flying across his fields in a southeast direction at Trinity and Belmont avenues, at treetop level. This sighting was reported to Kerman police detective Tom Gilpin.At 03:30 A.m. Lisa Harrison, a housewife observed the object approaching the city of Kerman from the northwest at treetop level from her apartment at Del Norte and Kearney Blvd. 03:32 A.M., Kerman police officer Amparano observed what he belived to be a tree fire at Del norte and California avenues, while stopped at Del Norte and Whitesbridge avenues. Officer Amparano drove to the location to confrim a tree on fire before calling out the fire department. Upon arrival Amparano obsevered a reddish object the color of a setting sun behind a tree, below treetop level and just above the field it was hovering over. When the patrol car headlights flashed on the object, it began to slowly rise and stopped approximately a hundred feet up. Ken Westbook Jr. was working in a field near the town of Tranquillity southwest of Kerman,when he observed the object at or above treetop level and he reported the sighting to Kerman Chief of Police James Van Cleaf. Amparano reported that when he attempted to light the object with his roof mounted spotlight, the object emitted a bluish white light toward the patrol vehicle and left at a very fast speed easterly, parallel to California avenue. Westbrook told Van Cleaf that before the object left it flickered or flashed and disappeared. Retired Special US Marshal Phil Maher was stopped at Whitesbridge and Grantland avenues, when he observed a reddish ball in the sky moving east at a very fast speed. Maher gave his report to Amparano and UFO investigator from Probe, Richard Zimmerman who later interviewed most of the witnesses. Meteorologist Carl Smith stationed at the Fresno air terminal reported that a day or two before Amparano's sighting he had observed red orbs flying west of Fresno like crazy airline pilots. A crop duster pilot flying out of an airfield in Tranquillity also reported a red orb that appeared to be a farmhouse on fire until it started to slowly rise and fly away at a speed faster that a jet plane. This sighting was in July during the night after 03:00 A.M. In January of 1979, the Madera Sheriff's Department reported similar red orbs as did Carl Smith flying northwest of Kerman in a crazy manner and there was an explosion like two orbs colliding together. The listed events were reported to the media and military. So here is a report from the computer of the man who experienced the sighting. There are problems with what was written in 1978 and what is written today. It seems that some of the descriptions of the event are different. I have been accused in other cases of misquoting witnesses but when I return to taped interviews, the original articles published at the time of the sighting, and what has been published since, I find that the witness is often mistaken. For example, J. Bond Johnson, the man who took most of the pictures in General Ramey’s office spent a decade claiming I had misquoted him, that I had altered his statements, and even when he heard the tapes, he denied he had said the things he had actually said. Here we seem to be moving into the same place. What is said today is not exactly what was said in 1978. This certainly provides us with a different perspective on the case and provides first-hand testimony for it, though that testimony is nearly three decades old. As I review the evidence, the theme here has taken a slightly different tone. It is not nearly as cut and dried as I had expected because much of the information in the original posts was taken from the sources that Amparano demanded that we review now and which he claims to have in his possession. This teaches a little about how these things work and I have seen this time and again. The memory of what was said in 1978 isn’t exactly the same as what was reported in 1978. Since we have been repeatedly given the “facts” of the mummy as established by Richard Doble and are told that no other scientists, anthropologists or archaeologists would go on the record, I thought it time to challenge this bit of misrepresentation. As I have noted, when we are told that no American anthropologists would go on the record, it might mean that none would go on the record based solely on examination of the slides. They wanted additional information and I don’t see that as an unreasonable request. In fact, it sounds just like the question a scientist would ask when presented with something like the Roswell Slides. Dr. Daniel Antoine, Institute for Bioarchaeology - Curator of Physical Anthropology: Based on the photograph, this appears to be the mummified remains of a very young child. The mummification process is likely to have been natural (i.e. buried in a very hot or arid environment) but it may also have been intentionally embalmed. Dr. Suzanne Onstine, University of Memphis: It does appear to be human remains (and likely a child), although the photo is too blurry to tell if artificial mummification procedures were done. It is certainly possible the body was naturally mummified due to dry climate and soil. That kind of thing happened all the time in many cultures. S.J. Wolfe, Director of the EMINA (Egyptian Mummies in North America) Project: Okay, it is a mummy, but very hard to tell if it Egyptian, South American or European. I see no wrappings of any kind, it appears to be a child or youth. Do you have a provenance on the slide??? That may help the determination. Dr. Patricia Podzorski, University of Memphis: Based on the image you sent, it appears that what you saw is the preserved remains of a human body, or a good imitation thereof. Since no wrappings are clearly visible in the photo, I can not determine the culture (Egypt, Peru, Asia, North America, etc.) or the date/ period (ancient or recent) of origin. Given that the head is turned slightly to the side and the color, it might not be an unwrapped ancient Egyptian mummy, but I am not able to be certain based on the visual information. Denise Doxey, Curator, Ancient Egyptian, Nubian and Near Eastern Art. Museum of fine arts, Boston: Yes, that would appear to be the mummy of a small child. Given all this, I hope that we can now move beyond the claims that other scientists, versed in the necessary disciplines, have not gone on the record about this. It is clear that their opinions are more informed than that of Doble. The trouble for some commenters here is that they agree with what Doble said and ignore everything else. It seems to me that there are many arrayed on the side of the image being an unfortunate human child based on their examination of the scans available and a few who are sticking to the idea it is alien while ignoring all the other documentation, photographs and evidence. For those unable to understand it, these are the remains of an unfortunate child. There is nothing alien about it. 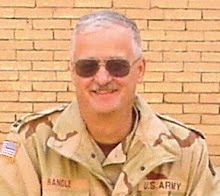 I have avoided talking about Hangar One sure that most people realized that it was more fiction than fact. I sometimes thought the lone fact was that there is an organization known as MUFON and everything else was pretty much invented for television ratings. That became more of a reality for me when I saw the latest episode, which is to say, the last one I saw but with the way they broadcast this stuff, I’m not sure what the last episode might have been. Anyway, I was just doing a video lap which is pushing the remote channel button looking for something interesting when I heard about a “star soldier.” This was a guy who claimed, if I have this right, to have been serving with an alien race as some sort of soldier or mercenary. Okay, this tale is not really out there yet, or at least, not that far out until we learn the entire story. Seems that the fellow claimed that he was abducted as a seventeen-year-old high school student (I assume he was still in high school) and given training as a soldier before his eventual deployment to… Mars. There he served for twenty years doing something that I failed to pick up on. I was more surprised by his claims of conscription into a military force that seemed to have no legal authority to draft him. I mean he couldn’t even run to Canada or somewhere else to avoid this service if he felt it against his personal code. He had no legal remedies to this forced servitude. He had no choice and he didn’t explain how he was compensated for his service. Okay, this still isn’t as far out as it would get. He sat there, talking about this service, and I’m wondering what his parents did when he disappeared. I’m wondering if they called the police, if they put his pictures up around town asking for information or if they offered a reward for his safe return. I wondered how they felt when their child disappeared in the middle of the night with absolutely no clue about his fate. I was also wondering what sort of skills he might have had to make him a target for alien conscription. Did he have some psychic ability? Some other special talent that is not obvious to us? Maybe he had a physical constitution that would allow him to survive in the thin atmosphere of Mars if they haven’t terraformed it to allow human life or if he was underground in some kind of artificial structure. But he explained all that away. After twenty years of service, he was returned to his bed and in his seventeen-year-old body some fifteen minutes after he had vanished. His parents never knew he had been gone and I would imagine if it had been a school night, he returned to the classroom the next day believing he’d had a very vivid dream. After all, he wasn’t any older, had no physical scars that weren’t there before his service, no evidence that he had lived for twenty years off Earth and absolutely no evidence that anything he said was true. Or for those who care, anything he said was true in our shared reality. As he spun this tale, I heard no laughing in the background. I heard no evidence that the producers of the program or that the alleged investigators of this tale thought of it as bogus. Here was this guy sitting there claiming that he had served on Mars for twenty years (or in alien service for twenty years) and had absolutely nothing to prove it. Apparently they thought it not that… unreal? Oh, I know what will be said. The aliens can bend and distort time so that they are able to do this. Of course no one can prove any of this, but what the hell, it just proves how powerful the aliens are and what their technology can do. After all, why would someone lie about this? Why, indeed. I don’t know why they would provide this guy any air time given the nature of his tale. If the producers wish to maintain any credibility they would have acknowledged the improbability of the tale, or better yet, not aired it at all. This is one of the better examples why rational people just don’t take ufology seriously. It seems there are those who actually believe this crap. I suppose you could claim that some of these videos are of something other than ball lightning, but I find this explanation satisfactory. As I noted long ago with a posting about fireball and meteor videos, these sorts of things, seen briefly, could account for some of the unsolved UFO sightings that clutter up the landscape. Both natural phenomena are rare, brief, and often surprising. Seen for a second or two it is little wonder that the sightings remain unidentified. These suggest to me that if we have sighting that lasts a second or two that we don’t bother to collect the data. The event doesn’t give the witness enough time to truly identify what is being seen and the fleeting natural of the visual simple confuses. A light in the sky, regardless of the nature of that light will not advance our knowledge unless another dimension is added. In the cases with the YouTube video compilations of meteor falls and now this one of ball lightning, we have an opportunity to adjust our perspectives. Like so many others, I had thought we were done with the Roswell Slides. It seemed that the reading of the placard, the discovery of the documentation that supported all of that, and the retreat of some of the experts would be enough to kill it. It seemed as if we had all the answers, documented to a level that is rarely achieved in UFO research… and it appears that I would be wrong because there are always those diehards out there. To sort of underscore this, Carey said during this most recent interview that the owner of the slides, whom he did not identify (Joe Beason) “wasn’t a Roswell guy or UFO guy but it looked like the body of an alien.” I am still not clear why anyone would jump to that conclusion, but according to Carey, that is what Beason did. The point is that Carey mentioned that Beason was not a Roswell guy shows the connection being made. The other point that Carey thought of as important, as he was discussing the “deblurring” of the placard, was that the placard seemed to have been written in cursive but when finally deblurred, it was in block letters. This bothered Carey and to him it suggested that something in the deblurring process was flawed. He mentioned that he wasn’t a computer guy but he just couldn’t understand this. The answer, however, was simple. 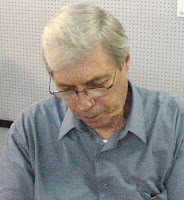 David Rudiak, who had first suggested that the lettering was in cursive said that his observation was based on the way the lettering looked in the scans he had been given. They were of the placard and little else which masked the true nature of what he was seeing. When he was given a higher quality scan that had more background detail, it was clear that the lettering was not in cursive. 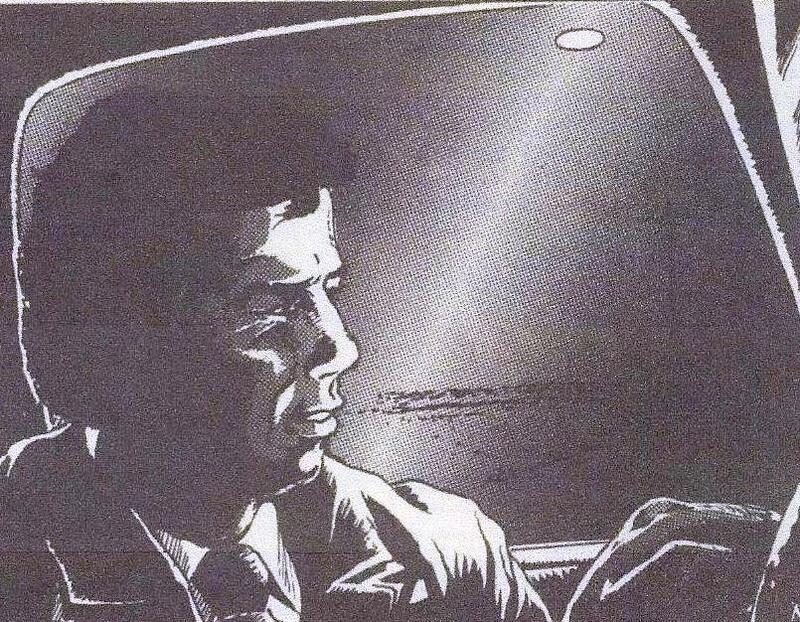 The deblurring of a higher resolution scan provided the answer which Carey seems to dismiss. Of course this argument about cursive, doesn’t explain why the floor as shown when the whole slide frame is revealed matches that in the museum and why other placards visible match the one in front of the “alien” image. Or, in other words, the slide was not taken in some obscure government lab, research center or facility. It matches the floor in the museum at Mesa Verde that was open to the public, and given the timing of the events, was probably taken prior to May 1947, which, of course rules out Roswell. Nor does it explain the other exhibits that are seen in the background of the slide. Clearly this is a museum setting and not the controlled environment you would expect if this was an image of an alien creature. It would not be out on display for everyone to see. I could go on in this vein, but is it really necessary? Carey is grasping at straws. The evidence that the image is that of an unfortunate child is overwhelming and the suggestions that it is something alien nearly nonexistent. But I want to make one thing clear. I do not believe that either Carey or Schmitt were participating in a hoax that they created. They might have been overwhelmed by their own enthusiasm and their desire to find some evidence of an alien UFO crash at Roswell, but they didn’t create a hoax. Fooled? Yes. Naïve? Yes… but not the creators of a hoax. We all get fooled sometimes and this is one of those times for them. Oh, it is certainly time to let it go, but once you have committed to something so deeply, it is extremely difficult to admit the mistake. Jason Kellahin was an AP reporter based in Albuquerque, New Mexico, in the summer of 1947. He received a call from the New York office of the Associated Press telling him that he needed to get down to Roswell as quickly as possible. According to Kellahin, "We [Kellahin and Robin Adair] were informed of the discovery down there...the bureau chief sent me and a teletype operator from the Albuquerque office." Please note that he specifically mentioned the discovery down there. I interviewed Kellahin in his home more than forty years later and he told me then, "It must have been in the morning because we went down there in the daytime. It would take a couple of hours to get down there..."
Jason Kellahin at his home. Kellahin continued, saying, "We went down to Vaughn [New Mexico]. Just south of Vaughn is where they found the material." The ranch, according to Kellahin, wasn't very far from the main highway (Highway 285) from Vaughn to Roswell. They turned from that highway just south of Vaughn, onto the Corona road. They were driving to the west and saw "a lot of cars and went over. We assumed that [this] was the place. There were officers from the air base. They were there before we got there." This does not agree with the affidavit that Kellahin would sign sometime later. Kellahin described military cars, civilian cars and even police vehicles parked along the side of the road. In one of the fields adjacent to the road, at the far end of it, were a number of military officers, not more than five or six of them. Kellahin left his vehicle and entered the field where he saw the scattered debris. "This man from Albuquerque with me [Adair], he had a camera. He took some pictures of the stuff lying on the ground and of the rancher who was there...Brazel was there and he [the photographer] took his picture." 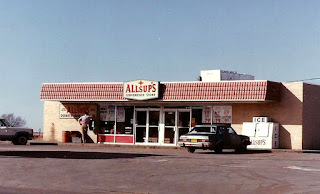 Convenience store in Vaughn, NM. Kellahin didn't remember much about what Brazel had said. "About the only thing he said he walked out there and found this stuff and he told a neighbor about it and the neighbor said you ought to tell the sheriff...it was the next day [he] went down to Roswell." Standing there in the field, near the debris, Kellahin had the chance to examine it closely. "It wasn't much of anything. Just some silver colored fabric and very light wood...a light wood like you'd make a kite with...I didn't pick it up. In fact, they [the military] asked us not to pick up anything...You couldn't pick it up and have identified it. You have to have known [what it was]. But it was a balloon. It looked more like a kite than anything else." The debris covered a small area, not more than half an acre. The military men were standing close by as Kellahin interviewed Brazel but didn't try to interfere. "They weren't paying much attention. They didn't interfere with me. I went wherever I wanted to go. They didn't keep me off the place at all. Me or the photographer." Kellahin tried to talk to the military people, but they didn't give him any information. "They were being very, very cautious because they didn't know." He didn't have much time for the interview because the military officers came over and told him they were finished and were going to take Brazel into Roswell. With Brazel gone and the cleanup of the debris finished, there wasn't much reason for the AP reporters to remain. Kellahin and Adair continued their trip to Roswell, arriving before dark. Kellahin confirmed some of this, saying that "We went down to the Roswell Daily Record and I wrote a story and we sent it out on the AP wire...Adair developed his pictures and set up the wire photo equipment and sent it out." The story about all this that appeared in the newspaper ended saying, "Adair and Kellahin were ordered to Roswell for the special assignment by the headquarters bureau of AP in New York." Kellahin, when he left the ranch, had expected to see Brazel in Roswell, the next day, but said, "I don't recall that I did. I think the military was talking to him and wouldn't let him talk to anyone else to my recollection...I saw him there but...there were some military people with him." Following the story as far as he could, Kellahin talked to Sheriff Wilcox. "When we got down there to the newspaper, he was there. I saw him there or at his office...By that time the military had gotten into it. He was being very cautious." Once they finished in the newspaper office, Kellahin returned to Albuquerque and Adair was ordered to return to El Paso to finish his job there. By the time Kellahin arrived in to Albuquerque, there was a new story for him that had nothing to do with flying saucers. Another assignment that was just as important as his last. There are some points that must be made. The raw testimony from Kellahin must be put into context with that provided by others, including Adair. Both Kellahin and Adair were trying to answer the questions as honestly as they could, attempting to recall the situation as it was in July 1947. However, they are at odds with one another. There clearly is no way for Adair to be both in El Paso as he claimed and in Albuquerque as suggested by Kellahin. The first problem encountered is Kellahin's memory of getting the call early in the morning. That simply doesn't track with the evidence. Walter Haut's press release was not issued until sometime after noon on July 8 and it didn’t go out on either the news wires until later. George Walsh of radio station KSWS remembered that Haut had telephoned the press release to him “about mid-day.” He copied the press release exactly, as Haut read it to him over the phone. Walsh, in turn called it into the Associated Press in Albuquerque. From there the release was put on the AP wire and that story was published in a number of newspapers. That means there would be no reason for the AP to assign a reporter (Kellahin) on the morning of July 8. There was no story about the flying saucer until that afternoon. And, by the morning of July 9, the story was dead and no reason to send anyone to Roswell. The photos had already been taken of the debris in Fort Worth and the information about the nature of the debris had already released to the press. Besides, the story in the July 9 issue of The Roswell Daily Record makes it clear that they, Kellahin and Adair, had already arrived in Roswell, coming down on July 8. Second is the story that Kellahin saw the weather balloon on the Brazel ranch. His description of the location, south of Vaughn but just off the main highway to Roswell is inaccurate (which is the advantage of having been there myself. I knew what the terrain looked like and how close, or far, it was from the highway.) The debris field, as identified by Bill Brazel and Bud Payne, is not close to the Vaughn - Roswell highway. In fact, the field where the debris was discovered is not visible from the roads around it. It is a cross country drive into a shallow valley. More importantly, by the time Kellahin could have gotten to that field, the balloon should have been removed if it was just a balloon as described by Kellahin. In fact, according to Marcel and the newspaper articles, the balloon was already in Fort Worth if we believe what has been reported. After all, a balloon wouldn't have taken long to collect and Marcel had done that the day before. Kellahin said in his affidavit that he had visited Brazel at the ranch house, met Brazel’s wife and young son. That is different from what he told me, and from the neighbors said and what Bill Brazel said. After meeting Brazel at the ranch house, they drove to the field where the debris was found. Kellahin's testimony of seeing a balloon out in the field is intriguing, not because he is an eyewitness to the balloon on the crash site, but because of what it suggests. If there was a balloon, it would mean that the Army had to bring one in. In other words, they were salting the area, and that, in and of itself, would be important. It would suggest that the Army had something to hide, if they were planting evidence. Given the sequencing of events, based on the newspaper accounts and other testimony, the earliest that Kellahin could have been in the field was late in the afternoon (around four or five p.m.) on July 8. However, by that time, Marcel and the special flight from Roswell were already in Fort Worth. If the balloon explanation is accurate, then the evidence had long since been collected and there would be nothing for Kellahin to see. Kellahin also said there had been photographs taken while on that field. These photos, according to Kellahin had been transmitted from Roswell. The photo of Brazel transmitted, however, was one that had been taken, not in the field, but in the newspaper offices. If there were pictures taken in the field they have never been printed. Had they existed, even if of poor quality, they would have been printed. After all, what could be better than pictures of Mack Brazel with the debris in the field? Here was the most persuasive of evidence… Brazel, military officers, standing in the field with the remains of a balloon but apparently those pictures were never printed by any AP newspaper at any time. By contrast, the seven pictures taken in Ramey's office were printed throughout the country. All seven have been located. Even the fairly rare picture of Irving Newton was printed in Texas newspapers and was used by the editors of Look when they printed their Flying Saucers special in 1966. But those that Kellahin claimed had been taken of Brazel on his ranch with the debris clearly displayed have never been found. That suggests that Kellahin's memory is flawed on this point. The best evidence available is that Kellahin did not stop at the ranch on his way down to Roswell. He is mistaken about that. The lack of the photographs and evidence about the location of Brazel on the afternoon of July 8 suggest it. The location that Kellahin gives is in error though he does suggest in his affidavit that rather than stumbling upon the field, he was led to it by Brazel. The ranch was not close to Vaughn, and the debris field is not close to any road. By the time Kellahin and Adair arrived in Roswell and were ready to begin reporting, some of the pressure was off. Ramey, in Fort Worth, explained that the material found in Roswell was nothing extraordinary. The FBI had issued a telex that suggested it was a balloon after discussing all this with Major Kirton in Fort Worth though it doesn’t seem the FBI bought the explanation. No longer was New York demanding pictures. In fact, several pictures had already been taken in Fort Worth. The interview with Brazel occurred on the evening of July 8, according to the newspaper article in the July 9 edition of The Roswell Daily Record. 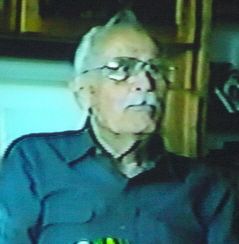 Brazel was brought in by the owner of KGFL, Walt Whitmore, Sr. Brazel was then interviewed by Kellahin, as well as a reporter for the Roswell Daily Record. The pictures transmitted, those of Brazel and George Wilcox, are ones that had been taken in the office for that purpose. Kellahin wrote his story, which appeared in the newspapers the next day. The point here, however, is that if you accept any of the Kellahin testimony as fact and use it to bolster a theory, you are building on a shaky foundation. We can document who was doing what and where at the time and Kellahin’s story does not match any of that. 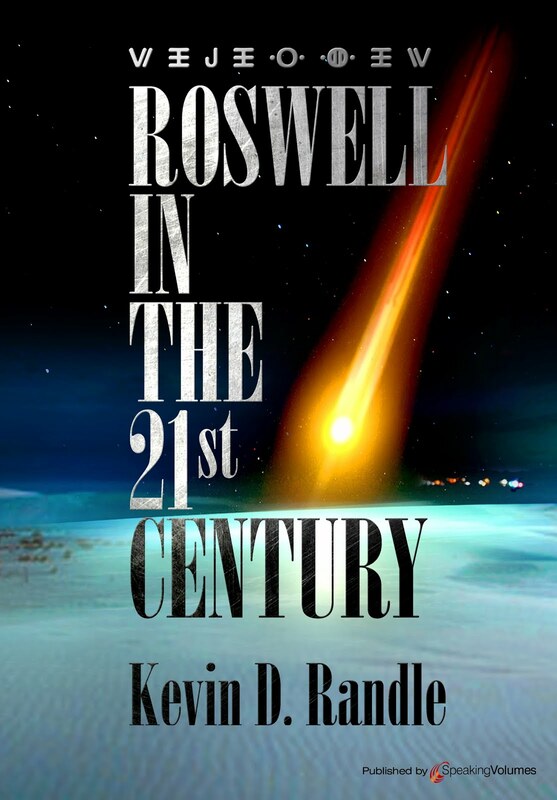 Yes, he was in Roswell and yes, he did interview Brazel, but he didn’t see him at his ranch, there are no pictures of Brazel in that field, and the time line suggested by Kellahin is badly flawed.